Chroma key compositing (aka “chroma keying) is a visual effect/post-production technique used for layering/compositing two images/video streams together, according to the color hues (chroma range). This technique is very popular in various fields as it allows one to remove a background from the subject of the video/photo (motion picture, news casting, video games industries). A color range in the foreground footage is going to be made transparent so that a background footage/static image (filmed separately) may be inserted into the scene later on. The chroma keying technique is really popular in post-production and video production. It’s also knows as color keying and color-separation overlay (CSO) or as specific color-related alternatives: green and blue screen. However, chroma keying may be done with backgrounds of any color that are different and uniform, but it’s green and blue screen backgrounds that work the best. They’re the most distinct from most human skin colors. It’s important that no part of the subject that is photographed or filmed doesn’t duplicate the color of the backing. When used for the weather forecast broadcasts, various weather maps are added on the parts of the image where the color is blue (if the screen is blue). Should the news presenter wear blue clothes, his/her outfit is going to be replaced with the background video. Chroma keying is fundamental in entertainment industry for the visual effects in video games and movies. Can you make a green screen with any color? The color used for your backing screen should never be present in the subject of your photography or video. If your model is wearing a green shirt and you’re taking the pic against the green screen, chances are that the shirt is going to disappear once you remove the green background. Basically, the green can be any color, but green and blue work the best as they’re the most different from most human skin colors. As long as your subject doesn’t have at all the color of the background, you should be able to have nice results. Why does a green screen have to be green? Truth be told, it doesn’t have to be green. Chroma-keying is a great process that allows isolating a single color/brightness value in an electronic image, turning it transparent in post-production later on. This is done so that you may place another footage “beneath” the color that has been blanked out. As green screen is used most of the time, it’s in fact the “chroma key” the main term, but they’ve become interchangeable. However, keep in mind that you may actually use any color. Green is a very popular choice as it doesn’t match any natural hair color nor skin tone, which is going to lead to nicer results for editing. Why is a scene shot with a green background for animation or adding special effects? Purely technical, any color can be used, but green and blue are going to stand out the best way. As the whole chroma-keying is about choosing a color and replacing it with another image, if your character wears a red t-shirt and you’re filming with a red screen, the t-shirt is going to be seen as a background. Blue screens make a solid choice as they’re easier to chroma-key. Green screens are more popular for many reasons. For instance, people like to wear blue clothing a lot more and green is the highest luminance of all the color channels. Green screen is really bright, but thanks to the high luminance, the level of light reflection is also high, which gives the “green screen”. What is the right shade of green to use as a green screen? Consistency is the most important one when it comes to green screen. There are plenty of brands to choose from, but you should look for the Gamma Sector Green. Paper, paint and digital green textiles- there are so many that allow you to play on set. When you don’t get the planned results, it’s not from the shade of green, but rather for the poor lighting/exposure. It’s a rookie mistake to expose the green too bright, for instance. However, if you’re planning to shoot some Leprechauns, it’s best that you don’t go with green screen, but with a blue one instead. What fabric is best for green screen? 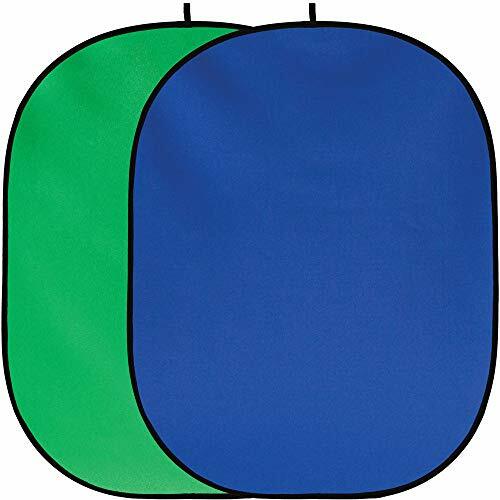 There are many green and blue screen fabrics and materials, and you should go with the one that fit the situation. You may need a more reflective surface for a small interview setup. Most of the materials are going to give you everything you need, so you need to choose wisely. Some like to simply paint the wall, but it’s going to take a lot of practice until you get the lighting right. Green muslin is really easy to get and it’s quite common to come with lighting kits for shooting green screen. It does wrinkle pretty easy so you may need a lot of patience to get it all nice and smooth. You may mount it to a frame and pull it tighter for better results. As its price is the seal dealer most of the time, the generic green muslin shouldn’t be your no.1 option unless your budget it tight. Composite Components Digital Screen and Digital Blue backing fabric is a nylon-spandex fabric that stretches tight and smooth, but you have to hang it in a frame the right way. It doesn’t wrinkle easy and provides good coverage. You may overlap several pieces for covering some large surfaces when you’re trying to create a portable SYC setup for a short amount of time. How much does a green screen cost? Even if the range of prices is quite generous, addressing all types of budgets, you should try your best and not get a cheap muslin screen. Even though it’s a great save for your budget, any small wrinkle is going to have an impact on the final results. You should look for a good chroma key backdrop that is laminated for foam or other backing material, which is going to maintain it wrinkle-free and flat at all times. even if you’re going to pay the extra buck for one, you’re going to enjoy the results for sure. Expect to pay $20 for a pretty good green screen, but be willing to have a splurge with $200 for a green screen (and higher than that) when you go for professional grade results. Can I use a green sheet as a green screen? You should always have even lighting so that the green is even. A reliable lighting placement and no wrinkles for your screen (if it’s fabric) are keys for nice results. The fabric has to be taut, which is a bit tricky to obtain unless you have a high-quality frame. If you’re going with this solution, you may end up paying more than for a professional green screen which comes with the perfect shade of green and it’s wrinkle-free. You can also paint a wall in Chroma key green, but you may have to play a lot with the lights in order to light it evenly. Made with non-woven material, the Andoer 1.6 x 3M / 5 x 10FT Photography Studio Non-Woven Backdrop is one interesting option for the amateur out there. The backdrop comes in black, white and green so that you can have your favorite pick. It’s large enough for helping you on various photographic sessions and you should use it for the portrait/studio shooting too. Not only that the screen is made with 100% non-woven fabric, but it’s also entirely seamless. The fabric is going to absorb the light and reduce the risk for reflection. The screen is made from just one piece of material and you can also use it as replacement for your muslin cotton backdrop. It’s machine washable and crimped along the edges for reducing the risk for tearing. It’s really easy to fold too. 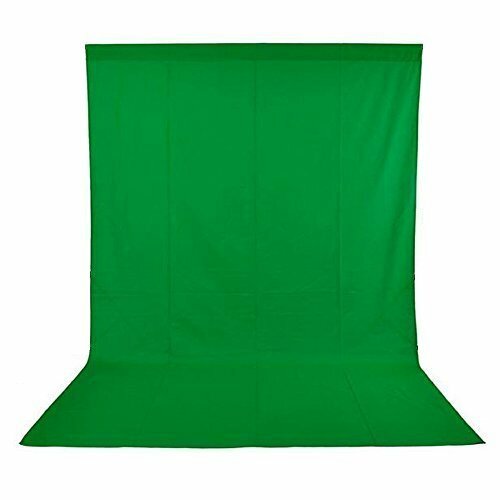 All in all, the green screen is a reliable, easy to use and easy to fold screen that works for amateur use and comes for a low-priced too. 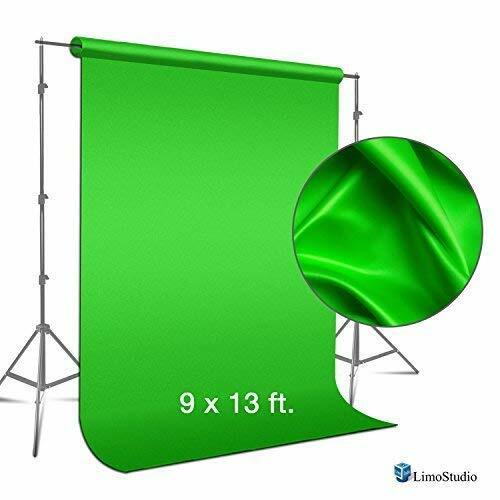 Lightweight and great for many photographic projects, the LimoStudio 9-foot x 13 foot Green Fabricated Chroma key Backdrop Background Screen for Photo is truly a nice surprise for the buck you’re paying. The backdrop screen is made with muslin and doesn’t wrinkle easy. It has a non-gloss surface and a flat side too, working for outdoor projects when used the right lighting. The screen comes true to size and hangs really nicely. It’s great for your projects and the rod pocket is easy to use. The fabric has a low risk for reflections and the green is really bright and even. Easy to fold and to carry around, the green screen is well stitched and has a durability feel to it. It has no rips nor stains and takes the intense use. 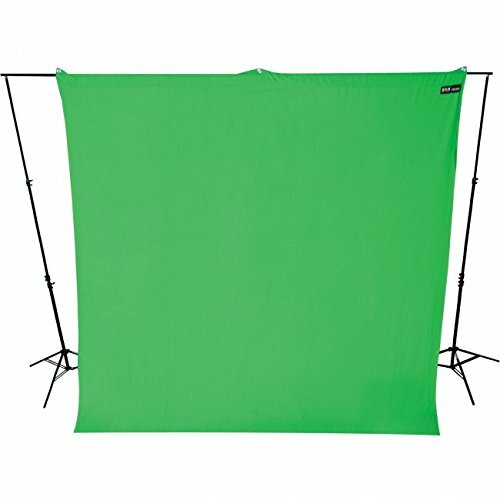 Versatile, dependable and easy to use for indoor and outdoor projects, the green screen is money well spent any given day. Finding a dependable green screen, without having to pay the extra buck for it is no walk in the park, but it’s not mission impossible either. 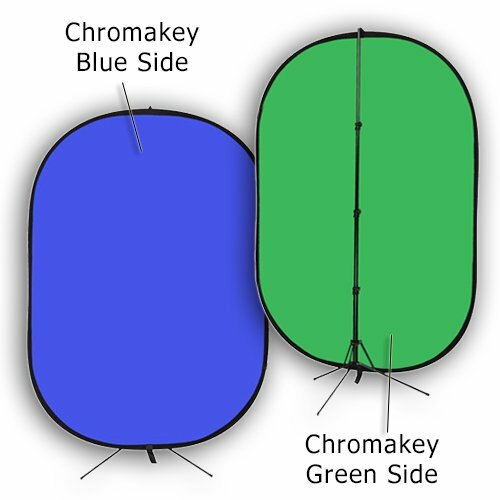 The Fancier studio Chroma key Green Chroma key Blue Collapsible Backdrop Collapsible Reversible Background is one solid option that manages to meet your needs without breaking the bank, at the same time. For less than $50, you’re getting a double sided green&blue background that is versatile and works for many jobs. It presents a collapsible design that doesn’t require much work for installation. the screen is Chroma key green on one side and Chroma key blue on the other side. Both colors are vibrant so later editing isn’t going to be that difficult. The green screen has a good build and the material feels long lasting. The screen is easy to collapse (maybe not the first time, but you’re going to get the hang of it). In order to get best results, you should iron it before the first use. It features tab on side so that you can also hang it of background from walls or stands. 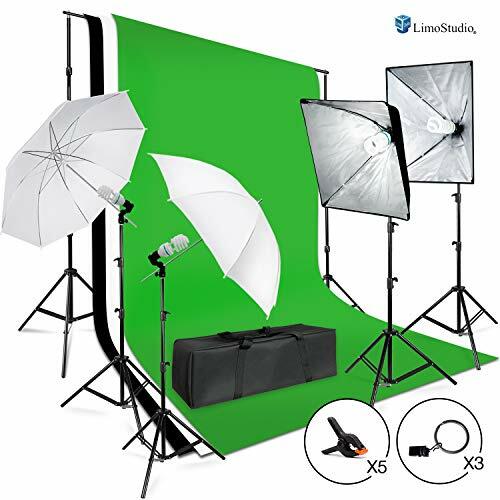 It’s a large and reliable green screen that comes in a carry bag that solves the storage and transportation problem. Nevertheless, for the reliability, versatility and good build, the green/blue screen is a solid choice to try. Sturdy and soft, the Westcott 130 9 x 10 Feet Green Screen Backdrop Wrinkle Resistant is ready to use out of the box and requires minimum ironing even before first use. The fabric is 100% seamless cotton, but feel like a mix of jersey and felt, in a good way. The fabric sure doesn’t wrinkle easy. It absorbs the light very well and eliminates reflection. It features one rod pocket on the tops so that you can also use it with background support system (it doesn’t come with one, though). The color is even, bright and flat, as long as you know a thing or two about good lighting. Once you’re done with it, it’s easy to fold it back and put it in its own bag. The bag makes it easier for storing it and carrying it around. Easy to wash, the fabric doesn’t hold wrinkles and it’s a great value for the price. However, as the goods outweigh the bad by a lot, we stand by the green screen and recommend it even for professional use. The double-sided Fotodiox Pro Collapsible Background Kit – 5×7’ Chroma key Green/Chroma key Blue 2-in-1 Background Panel with Support Stand is going to be a great addition for both amateur and professional users. The panel has Chroma key Green and Blue and includes support stand for an easy setup. It has just the right size for various filming or photography projects. You may raise the support stand up to 7ft. for holding the panel. The collapsible design is very well made and it just pops out for use. The spring metal frame is durable and the material construction has a durability feel to it. The frame pops open the backdrop instantly and holds its shape. The colors are good quality and ease your chroma keying process later on. The fabric is 100% cotton and you may only need to iron it for the first use. The whole system is highly portable and lightweight. It comes with its own carrying case for more versatility. Regardless of the minor issues, for the overall quality, versatility and long lasting feel, you should definitely take the leap of faith and give it a try. The more you’re willing to pay for your green screen, the more you should expect in terms of durability, versatility and overall value. It’s the case of Limo Studio 3meter x 2.6meter / 10foot. x 8.5foot. Background Support System that includes not only green, white and black screen, but also 1 backdrop support stand with cross bar, light stand tripod, light bulbs and bulb socket as well. The whole system includes pretty much everything you may need for a nice photographic project. the white umbrella reflector and the lighting diffuser are going to help you adjust the light according to your specific projects. You may adjust both the width and the height, whereas the locking system is going to make the system safe and sound throughout the use. The tough light stand is easy to adjust for height and works just fine with the Soft Box Reflectors. The material for backdrop is great for the chroma keying, even if you may have to do some light ironing for best results. You also get a carry bad that is made of Premium Oxford Nylon. It’s water resistant and comes with an external pocket for storing muslin, backdrop support, umbrellas and the camera. The whole system is easy to use and highly versatile. The setup is user friendly and the system is going to take the use for a good period of time. All things considered, as it’s dependable, great to use in many projects and well made, the kit is one purchase you shouldn’t skip. 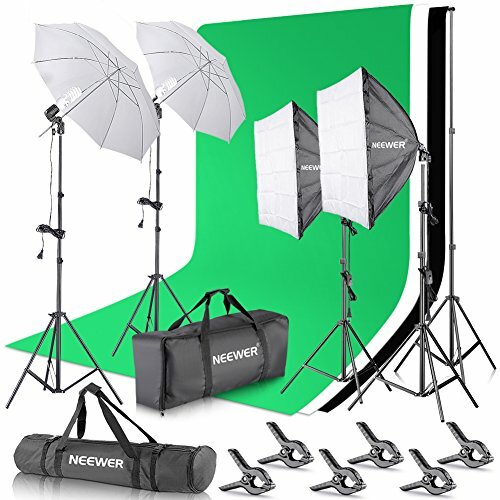 For the photography fan that is ready to take the passion to whole new level, the Neewer 8.5 x 10 feet / 2.6 x 3 Meters Background Support System is definitely the best investment to make. For just one price you get a lot more than a green screen as the kit also includes so many accessories. Light stand, bulbs, white umbrella and a single head light holder are going to help you for completing your photographic projects. The backdrop is made of 100% muslin and hangs nicely. It’s plain weave and easy to clean in the washing machine. It’s a lightweight fabric that doesn’t wrinkle fast. You get green, black and white backdrops with this kit, for more versatility in your projects. The backdrop clamps ease out the installation. The backdrop support system is well made and it’s going to take the intense use. The stand is made of aluminum and the detachable crossbars allow easy adjustments for both height and width. As a matter of fact, the light holder and the light stand also have a durability feel and are ready to handle intense use for quite some time. You may attach a bulb to the light stand or the umbrella- whatever works better in a project. The umbrella is a white translucent one that diffuses the light output along with the soft boxes. All the accessories come very well organized in a carry bag. Not only that you may carry it around nice and easy, but you also find easy everything you need. Even if the system isn’t all roses and rainbows, it’s still a wise investment of your money and you should take the plunge with it.